Return boat transfer to/from Semporna, dive/snorkel equipments, briefing & dive master, Lunch*1, jetty fee. Kapalai island – The mere name conjures the image of crystal clear waters and a floating paradise like no other. A 45-minute trip from Semporna by speedboat, Kapalai island is one of the many beautiful diving havens in this part of the world. However, Kapalai is truly unique because it is not quite an ‘island’. The 40 chalets are built on high wooden stilts in the middle of the ocean. Visitors can enjoy the sights of marine life in action as they stroll along the boardwalk, a sturdy construction that connects the various sections of the floating resort. The resort has 40 chalets, equipped with basic amenities, including tea and coffee making facilities. Sibuan Island, locally known as 'Battleship Island' for it‘s extinctive shape, is located app. 30 mins by speed boat from Semporna. Sibuan is one of the smallest islands in the whole bay but it is very popular for swimmers and snorkelers and certainly the most photographed island after Sipadan. Sibuan Island got a gentle falling, white sandy beach that is perfect for swimmers and non swimmers alike, someone can play in the shallows without being worried about stepping on any sharp coral. Further outside, at the drop off, there are beautiful coral formations to discover with plenty of fish hiding in between. The unique cuttlefish as well as turtles and sting rays can be seen here quite often. More experienced divers will appreciate the chance to get close up to mandarin fish, frog fish and ghost pipe fish. Pick up from hotel in Tawau City (Extra Transportation Service - price not included). Depart from Semporna Jetty to island. 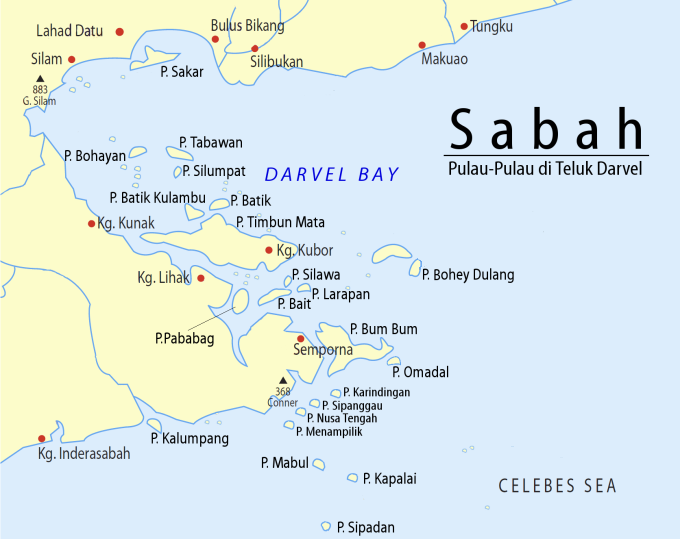 Arrive Mabul / Kapalai / Sibuan island. Start the 1st snorkeling by boat in the island. Take a break and relax yourself. Transfer back to Semporna Jetty by speedboat. You may choose for Leisure Diving (MYR480 per person), or Discover Scuba Diving (MYR550 per person), please notify us upon booking. Please advise which island(s) you would like to visit upon booking: Mabul / Kapalai / Sibuan. If you wish to visit Mabul and Kapalai Islands, you may need to pay extra MYR 10 per person. Age limit for snorkeling is 3 years old and above; Age limit for diving is 12 years old and above. 50% discount for aged 4~12.